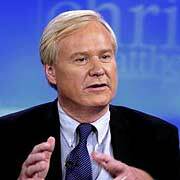 Yet, in the next segment, as Matthews moved the discussion in the direction of how poor a job the president is currently doing, no one on the panel questioned the results of a new poll stating that only 38% of the country approves of the president's job performance. This suggests that these panel members only believe Americans are intelligent and informed when they agree with them. What follows is a full transcript of this discussion. Chris: Let's take a look at what Americans think right now. There was a poll by NBC. It talks about tough treatment and what we’re doing right now. According to a "Wall Street Journal" poll 55% of Americans right now are comfortable with the way we're treating terror suspects. Only 30% think we've gone too far. Sullivan: I don't think they know the full truth of what we're doing. For example, do they know that we waterboard people? Chris: Explain that. That's fascinating. That means you're going to drown, right? Sullivan: We know for example because the Pentagon has said it forced one person in Guantanamo into near drowning and then they take you out of the water at the moment you feel like you're going to die and then they do it again and again. Andrew: It's not focused on specifics. Michelle Norris of NPR: I'm not sure that I agree with you there, though, because I agree with Andrew. I don't think people really know what's going on. Abu Ghraib, for instance, the worst of those pictures have not seen light of day and I think that if people really understood what was happening there and what might be happening in these black sites those numbers might be different. Michael Duffy of TIME: I think their attitude about torture might be different if they knew how little they were getting out of this. And the one good record we have…we’ve had an interrogation, that was a prisoner number 63, Muhammad al Khatani, made it very clear that they didn't get after 84 days of this very much intelligence at all.